What? My first reaction to these furrie creatures was - it must be a stag do. Always plenty of those around London on a Saturday night. Nope not this time. 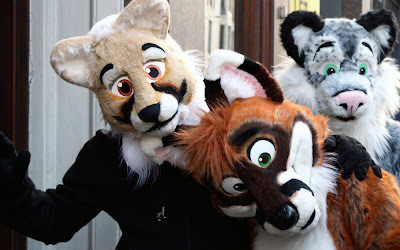 LondonFurs is the London based group of Furry Fandom . No wiser? Ok when I asked, the ones not in costume told me they represent animals with human traits (or was it the other way round). They do this on a regular basis for fun. I've added a new word to my vocab after this encounter. Anthropomorphism. How many of you know this word? Please let me know. This is never a dull city. I have heard the word mentioned, sometimes over Disney characters. These guys remind me of the early 1970's kids show called Animal Kwakers. Remember it? Yep, I know the word well. Some people treat their pets as if they were human, anthropomorphizing. Well, at least they are having afun with it. And it makes for a fun photo-op. So funny! My roommate is a "furry" - she draws animal art and makes costumes. Known that word for donkey's years! That looks like so much fun! But I don't think they can do that regularly in the Philippines' heat. How cute! For the word, never heard, and I'm an English teacher, ha ha! Sure I know the word. My wife and I live in this kind of world every day as we marvel at the apparent wisdom and understanding of our cat, who, incidentally, is named Walter Mitty. Walter Mitty? That's my cat!! How did he come to live with you Bert? Anthropomorphism is a common term in literature and film study. And...Furries are kind of an odd breed. But hey, it takes all types, I guess! i've heard of this word! A fun word! Difficult to spell, but a great one to toss out in casual conversation. :) I've not seen these creatures before. Interesting.